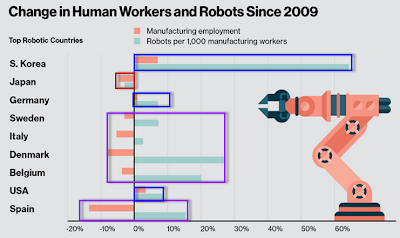 Mish's Global Economic Trend Analysis: Rising Robots: Is it Obvious Robots Cost Human Jobs? Looking for Someone to Blame? Rising Robots: Is it Obvious Robots Cost Human Jobs? Looking for Someone to Blame? Technology Review has an interesting infographic on the Rising Use of Robots, and which sectors show the biggest increase in use. I broke up the infographic into a series of smaller ones for purposes of discussion, adding red, blue, and purple colored boxes in the following chart. In Europe, except Germany, robot usage is up and employment down. 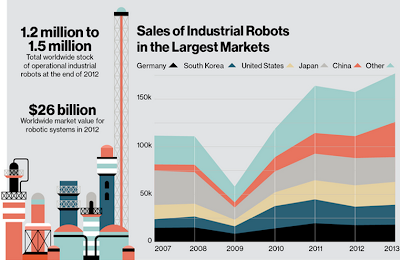 In the US, South Korea, and Germany, robot usage is up and so is human employment. In Japan robot usage and employment are both down. Japan did not even benefit from a falling Yen. This shows the relative increase in demand for US and Korean cars, and the relative lack of demand for Japanese cars and European cars other than German cars. In the US, as long as cars sales remain strong, it appears auto jobs will stay. How long will that be? Note the robust use of robots in automotive and electronic. Contrast that with the three lowest usages of pharmaceuticals, food, and plastics. Given the huge numbers of people employed in food industries, especially fast food, a growth area for food robotics seems relatively easy to spot. Cost and performance of robots vs. cost of human labor is the key impediment to more robot use in food service. Social concerns may also be at play. Do people prefer social interaction and the occasional bad server to a robot for whom you have to leave no tip? 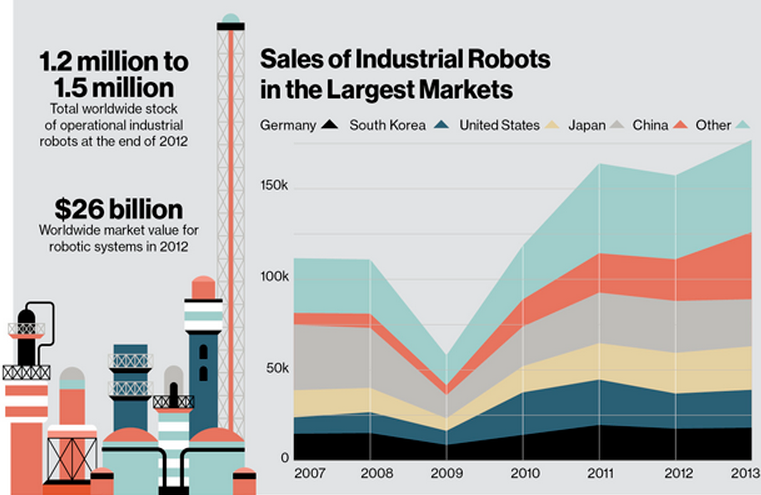 Robot sales are up, and so is job growth in the US. On a comparative basis, job growth in the eurozone, except for Germany is stagnant. A comment to the infographic by Cathal Haughian caught my eye. Haughian commented "Those countries that have high minimum wages automate first. I had a tour of Mc Donald's newest Chicken factory, in China, this year. It employed a third of the workforce of a similar plant in the US. It's fully automated. Slaughters 5 million chickens per day. Robots the size of a two story house. Amazing. The Robot revolution will break the back of our economic system by 2020, I'd bet." 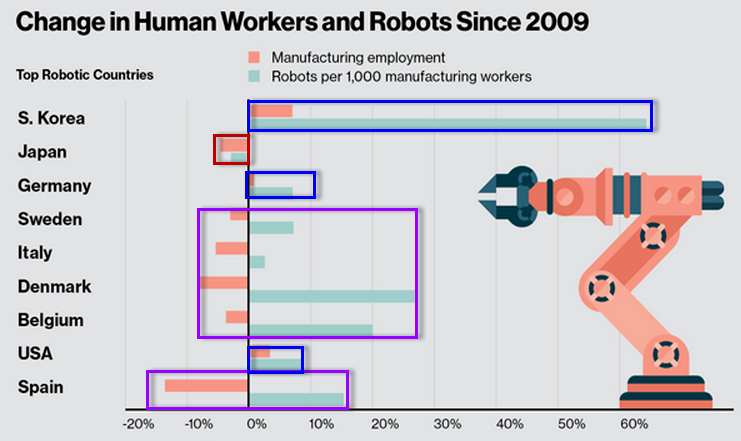 Technology Review editor replied "No it's actually more ambiguous than that, obviously: sometimes robots create entirely new jobs in new industries; sometimes they allow reallocation of labor to more productive uses; sometimes they sustain industries that would otherwise disappear. The truth is that no one knows whether we are witnessing a long-term restructuring of employment (in the sense that "full employment" may be a lower percentage of the population in industrialized nations) - and anyone who tells you otherwise is an ideologue on one side or another of this debate." I side with the editor. Over the long haul, technology creates jobs. The problem being "over the long haul". It's obvious robots increase productivity. But that is not the only force in play. The Fed (central banks in general) have cheapened the cost of money so much that some of the increase in use of robots is due entirely to cheap money. Moreover, the push for rising minimum wages has done the same. Set the minimum wage at $20 per hour, and I bet you see far more robots, in far more places than you do today. Technology improvements are an inherently good thing. They lower prices, increase standards of living, and give us more free time. Yet, if robot usage is artificially high thereby costing human jobs (and it likely is), blame the Fed for poor economic policy and blame Congress for poor fiscal policy. Don't blame the robots or the companies that use them. Some claim it's different this time, that robots are going to take your job no matter what it is. For a robust discussion from multiple angles, including a couple of solutions, one of them grim, please see It's Different This Time: Humans Need Not Apply; Two Possible Solutions.